Foundation of a Blog - Moms Make Income From Home! The Foundation of a Blog is the process of organizing your site. When you plan your website structure you are able to proceed in logical steps with your website content. 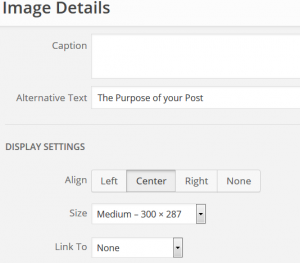 This will allow you to easily execute additional posts or pages that expand your site while maintaining it as it continues to grow. By organizing your site, you will find that you know more about your site. It will make it easier to know what is increasing your traffic and it will help you stay more focused on each element as you are writing your articles. One way to plan your website structure is to track these elements from each page or post into a spreadsheet that can be continually maintained. If you do this from the creation of your site, you will save yourself some valuable time later once your site has grown considerably. The first column on your spreadsheet can be the name of your Page or Post. Clarify if it is a parent page or a child page? One way that I distinguish my sub pages or child pages is with a — before the page or post name and then I put that page under the parent page. As you can see from my example of Reviews on my site. I list my Wealthy Affiliate Review with the added –. Wealthy Affiliate is one of the top rated internet hosting, training, and community programs out there today. If you haven’t read my review yet, it is worth the time to simply read it. They offer an extensive 10 lesson course that is “FREE”. What is the purpose of your article? 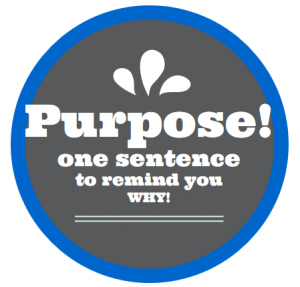 When you write down one sentence that encompasses the main purpose, this will help keep you focused on that one main point. There is nothing worst than expecting to read a page on something that you are looking for and the writer doesn’t stay on point and you never get the information that you are looking for. This can also help you if you have another point off of the main purpose that you can write a different article on later. Go ahead and enter this in the spreadsheet on a separate line even if you don’t have a Page Name yet. The keyword or keywords are very important for traffic to your site. You should always spend some time on researching the best keywords for each page/post. The use of a keyword research tool is recommended. 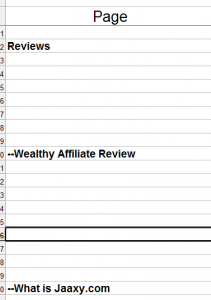 If you are using Wealthy Affiliate, they have a free keyword research tool. 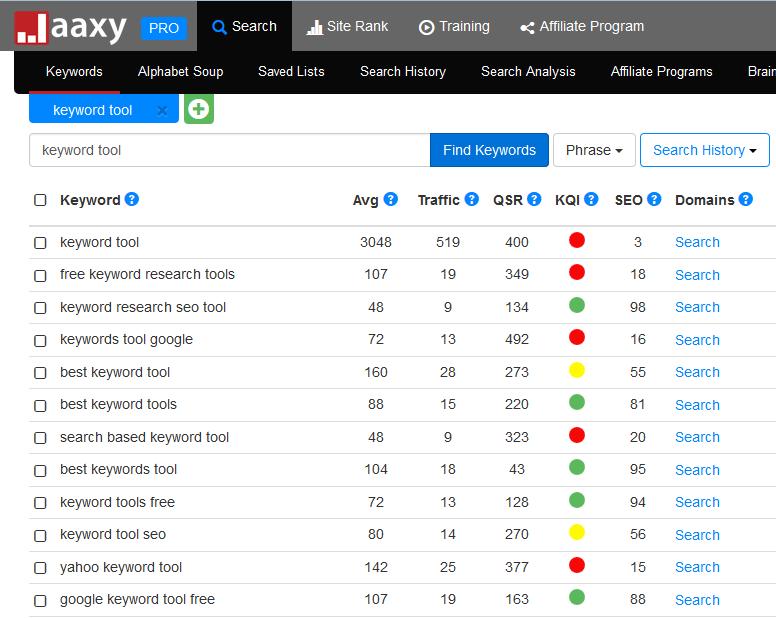 Another great keyword tool is called Jaaxy. This program will show you the average monthly searches, your expected traffic if you are on page one of a search, your competition (QSR) , and a SEO score. 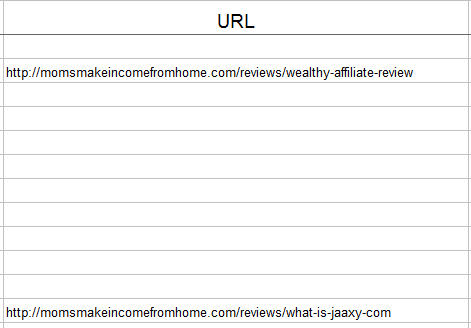 Jaaxy offers 30 free keyword searches when you enroll in the free Wealthy Affiliate program. I highly recommend this top rated program. Here is my personal review of Jaaxy if you would like to check it out. Here is a Jaaxy search on “keyword tool”. I love and use Jaaxy every day. It is such an easy and valuable tool to use. 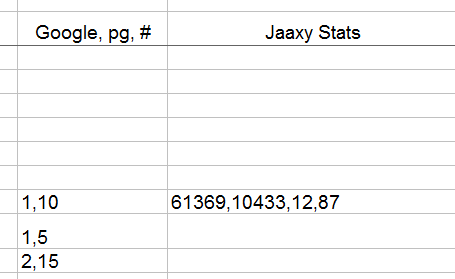 Once I choose my keyword, I put the Jaaxy stats into my spreadsheet. This will show me a metric of what I am expecting from each keyword that I have chosen. Then I can check this with my Search Engine Results after my page has been indexed. By periodically checking your search engine results, you will know if your keywords are working for you or if you should choose another keyword to increase your traffic. Keep track of these periodical results in your spreadsheet. Once you start adding more and more images to each of your pages, you might start to forget which ones you are using for each page. List on your spreadsheet each image or video in the order that they are found on the page. This should help with eliminating image duplication. I also put the source of the image in parenthesis behind the image. Keeping track of the source is just an added benefit in case you are looking for something similar in the future. Use the ALT Text for an image description. 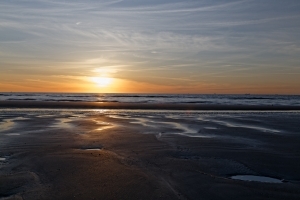 For each image you should be using an ALT text description to identify what the picture is of. This is a good place to use a keyword. Make sure the description is identifying the image though. Remember that search engines cannot interpret an image, only the words used. We simply use images to help the reader. Keep track of this ALT text in the column beside your image so you are not repeating the same text. You will want to link your pages and posts on your site to other pages and posts on your site because of the subject relevancy. Also to help your readers go directly to something else on your site that interests them. Keeping track of these is important so you are not overusing links to some pages and underusing links to others. When using a link, you can use a Title to describe the page you are pointing the link to. This can be a great opportunity to use a keyword from the title of a page or post. You should have external links from your site. See my post on What Is Page Optimization? to see why this is really important. This external link could be to an affiliate source, a wiki definition, a relevant source related to your site niche, etc. You probably have links from your social networks to your site. Keep track of these links to make sure you are fully utilizing linking with all of your pages and posts . It is good if you are using all of your social network (Facebook, Twitter, Pinterest, Google+, Linkedin) accounts to help increase your traffic. The use of your headers is important especially with keywords. How many H1, H2, H3, H4, H5, and H6 do you use? Keep track of each. Don’t use more than one H1 on each page or post. By entering these in your spreadsheet, it will help you to know if you are using the same Header for each similar category on your page. Keyword Density plays a part in how Search Engines rank your pages. How important is a topic for debate. I feel it is something to at least think about so I do track this for each of my pages. Based on my data, it seems to be a factor in ranking. How many words make up the perfect word count? Search Engines seem to like at least 800 words but there is not a magic number. I believe you need to write whatever it takes for your subject to get across. That being said, I still keep a word count to make sure I have a good quantity of words without compromising the quality of my content. Copy the link to your site into your spreadsheet. This will make it handy to copy and paste when you are setting up an internal link to another page on your site. What does your site need? It is good to really think about your article before you post it. Is there something missing or an image you can’t find? It’s okay to go ahead and post. Just capture the missing information so you can easily go back and add it later once you find what you are looking for. 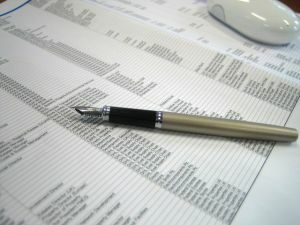 Here is the Foundation of a Blog spreadsheet that I use for this Blog. 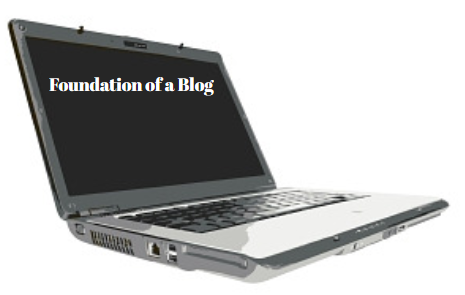 I hope you have enjoyed my post on the Foundation of a Blog. Let me know if you have any questions. Previous PostWhat is Page Optimization?Next PostWhat is Wealthy Affiliate for? Very good post! pretty well explained… I really like it. I’ll bookmark this site so I can study it and follow all your advices. Thank you for posting. I’m glad this information has been a help to you. Thanks for the feedback Danielle! I’m glad my site will help you with yours! issues. It was truly informative. Your website is very useful.